Jewish groups have criticised Labour's ruling body for including "caveats" when it adopted an anti-Semitism definition in full.The National Executive Committee on Tuesday accepted the International Holocaust Remembrance Alliance's definition and accompanying examples. But a statement was also agreed by the NEC aimed at protecting free speech.The Jewish Leadership Council said this addition would "drive a coach and horses" through the IHRA definition.It also criticised Labour leader Jeremy Corbyn as he is understood to have suggested a more extensive additional statement focussed on allowing criticism of Israel - but that failed to win enough support from NEC members. Reality Check: Is anti-Semitism on the riseLaura Kuenssberg: Way out of the mess? Jewish Labour peer Lord Dubs told BBC Newsnight that the party had done the "right thing" and seemed to have "turned a corner".Lord Dubs, who arrived in Britain in the 1930s as a six-year-old fleeing Nazi persecution, said he did not think Mr Corbyn's reported suggestion was a "helpful one but where the NEC ended up, including the additions, are sensible". The NEC agreed to incorporate all 11 examples of anti-Semitism cited by the IHRA into its code of conduct, including four it left out in July.It also added a statement ensuring "this will not in any way undermine freedom of expression on Israel or the rights of Palestinians". In response, Labour Against Anti-Semitism said adding the statement appeared "to be about protecting the freedom of racists to present vile views".A spokesman said: "There can be no caveats, no conditions and no compromises with racism. "We are disappointed by the decision of Labour's governing body, the NEC, to diminish the IHRA working definition of anti-Semitism via the attachment of a 'clarification' that risks giving racists in the party a get-out-of-jail card. "Jennifer Gerber, director of Labour Friends of Israel, said: "It is appalling that the Labour Party has once again ignored the Jewish community ... it should adopt the full IHRA definition without additions, omissions or caveats. "She added: "A freedom of expression on Israel clause is unnecessary and totally undermines the other examples the party has supposedly just adopted. "Labour MP Dame Margaret Hodge, who has been highly critical of Mr Corbyn's approach to tackling anti-Semitism, said the party had taken "two steps forward and one step back". Way out of the mess? By the BBC's political editor Laura KuenssbergPerhaps this marks the beginning of the end of this sorry mess. But what makes an early resolution tricky is the caveat that Labour has included alongside.It will be important to many of Mr Corbyn's supporters who want the right to criticise Israel.But for those campaigning against anti-Semitism, it still sends a message that Labour might want to make exceptions, that the party is saying "yes, but", rather than "yes, of course", to loud demands from the Jewish community that they take the strongest action possible against those who would foment tension. While Mr Corbyn urged the party to adopt the IHRA definition in full with all examples at the NEC meeting, he also set out concerns some Labour members had raised about limitations on freedom of speech.The BBC's political editor Laura Kuenssberg said she understood the Labour leader suggested a more extensive accompanying statement stating that "it should not be considered anti-Semitic to describe Israel, its policies or the circumstances around its foundation as racist because of their discriminatory impact, or to support another settlement of the Israel-Palestine conflict".Jewish Leadership Council's chief executive Simon Johnson said: "It is clearly more important to the Labour leader to protect the free speech of those who hate Israel than it is to protect the Jewish community from the real threats that it faces. "Joan Ryan, chair of Labour Friends of Israel, also told BBC Newsnight Mr Corbyn's statement was "deeply concerning". The party has struggled to contain a long-running row over claims of anti-Semitism within its ranks.Shadow business secretary Rebecca Long-Bailey said the NEC's decision on Tuesday was a "clear indication of our direction of travel" and Labour would now hold a consultation on changing the wording of its code of conduct.But she maintained the party was not trying to "water down" the IHRA definition and examples when it agreed to the freedom of expression statement.Labour MP Chris Williamson, an ally of Mr Corbyn, said Jewish opinion was not "homogenous" when it came to backing the definition and the party's decision to adopt it was a "pragmatic" one. 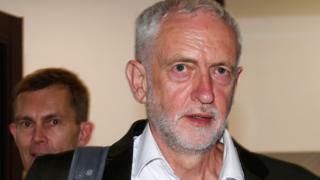 "He set out the position and said it was important, in view of the pressure, the party needed to adopt all the examples notwithstanding the criticisms by the original author of them," he told the BBC.In a separate process, Labour MPs will vote later on whether the parliamentary party's rules should be amended to include the full IHRA definition and the accompanying examples.